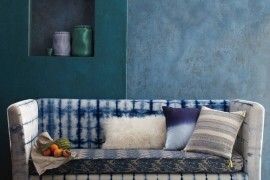 Are you in an indigo mood? Like a good pair of jeans, this classic hue goes with everything. 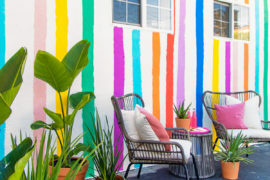 This spring indigo is making a comeback, and retailers such as Pottery Barn and Anthropologie are putting the shade front and center. Today we take a look at 12 new finds that make one thing clear: indigo is a color that deserves a second look! 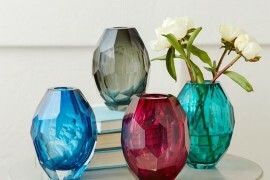 Shades of indigo range from royal blue to deep navy. Our first batch of indigo items boasts a classic style that reflects the color’s versatility. 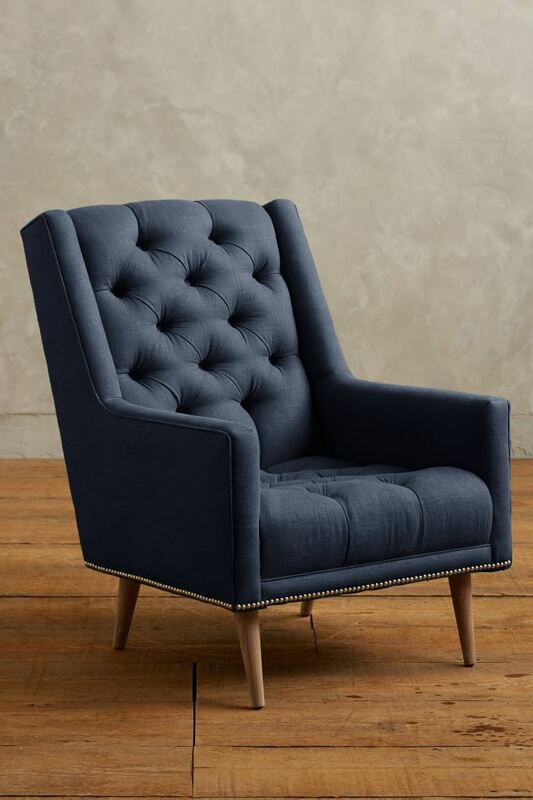 This Linen Booker Armchair from Anthropologie was inspired by a flea market find. 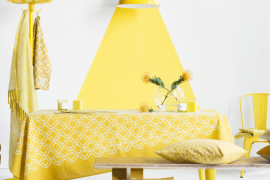 Mid-century flair meets plenty of tufting, enabling the piece to blend with a range of styles. Who’s ready to curl up with a good book?! Stripes are undeniably classic. 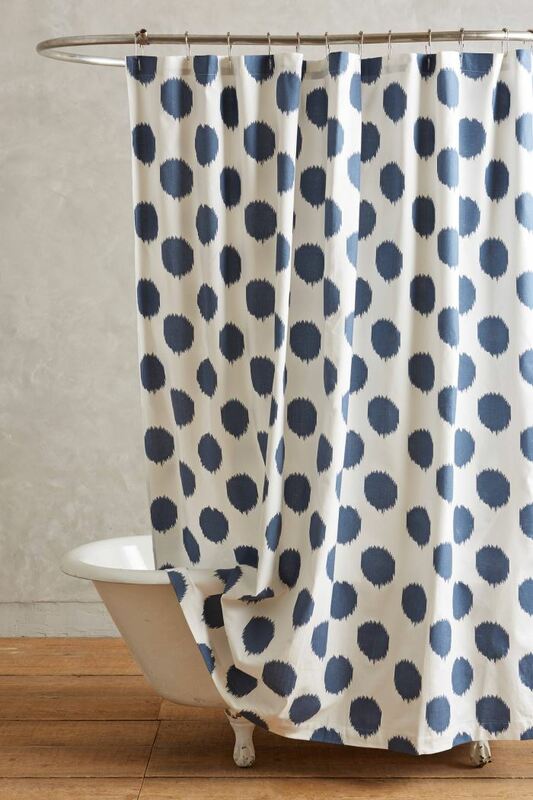 Add a classic shade like indigo to the mix, and you have a tried-and-true combination that will never go out of style. 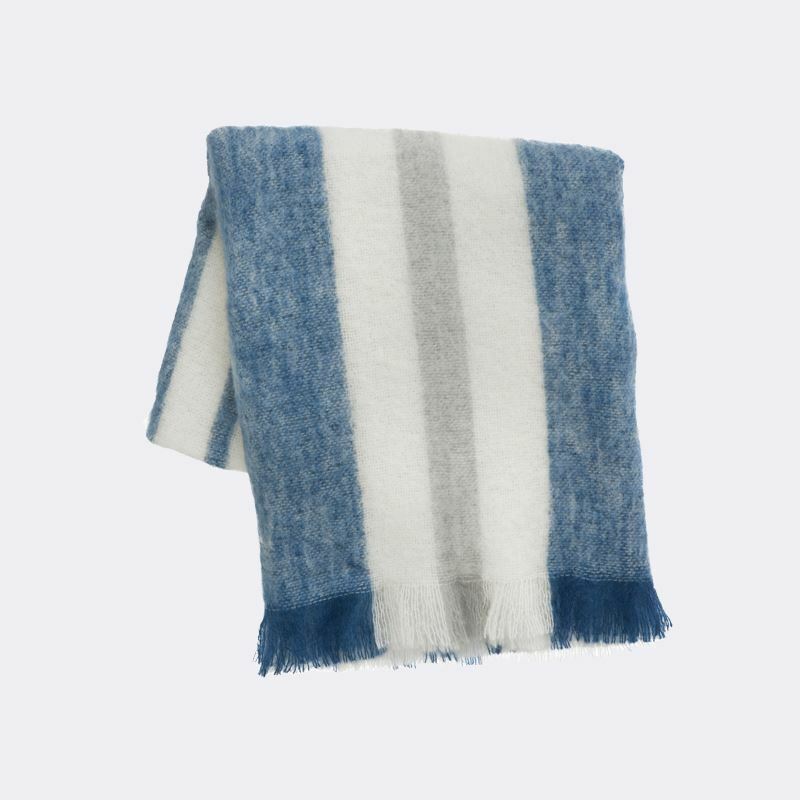 This Mohair Throw from ferm LIVING is as cozy as it is timeless. 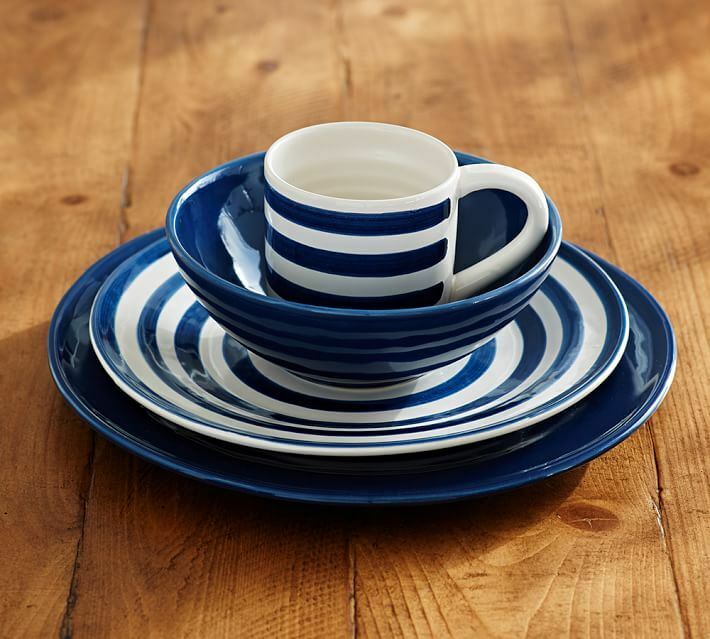 Indigo visits the tableware realm with this Reese Dinnerware from Pottery Barn. Purchase dinner plates, salad plates, bowls and mugs in sets of 4, or buy a batch of 16 pieces in one fell swoop! 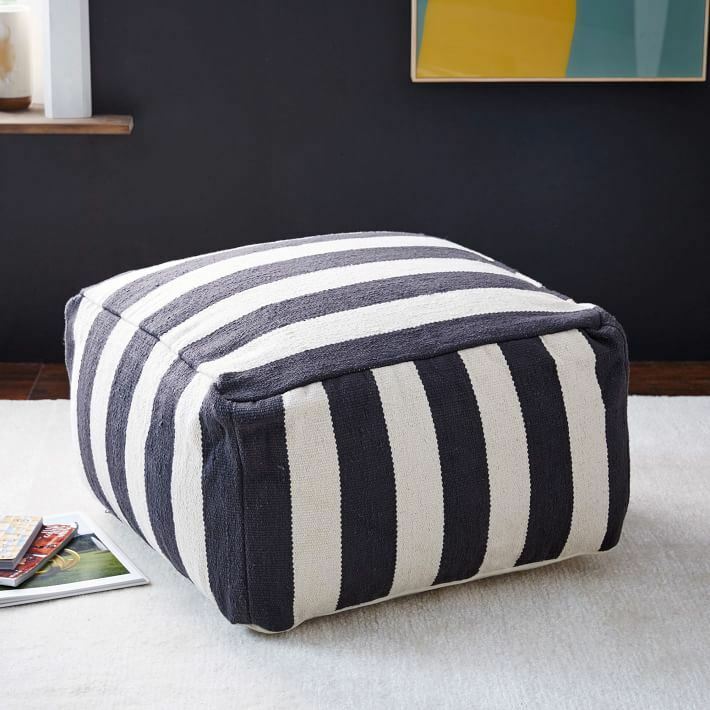 This Simple Stripe Pouf from West Elm is made from 100% cotton. 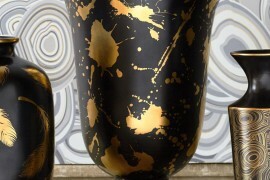 Not only is it the perfect blend of function and style, you’ll be glad to know that when you purchase this piece, you support the skilled Indian artisans who crafted it. 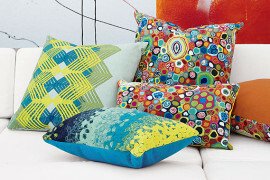 The artisans earn a premium for each pouf that’s sold, which ultimately benefits their communities as well. There’s something truly classic about botanical prints. 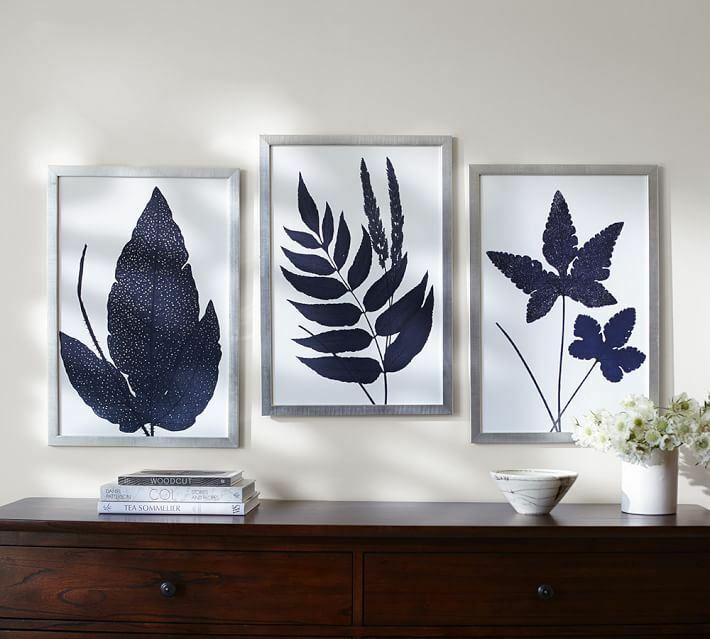 Add a healthy dose of indigo, and you have these Indigo Ferns Framed Prints from Pottery Barn. A white background enables the designs to truly stand out, and with beautiful framing in distressed silver pine, each giclée print gets the setting it deserves! 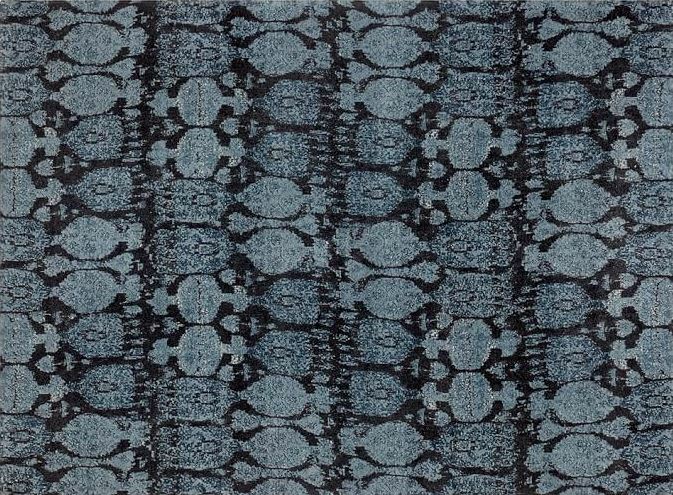 Rich color comes to life on the Dorringon Ikat Printed Rug from Pottery Barn. 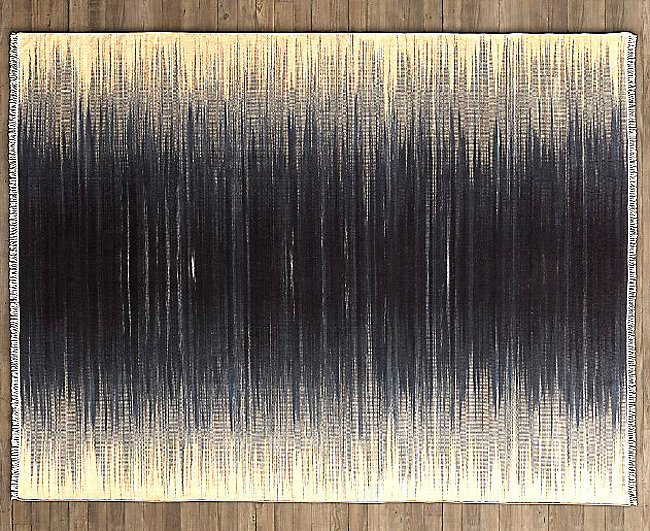 As stated in the product description, “This rug is an artful interpretation of an Indian ikat that featured a motif taken from a 6th-century fresco in the Ajanta caves.” A work of art in hand tufted wool! 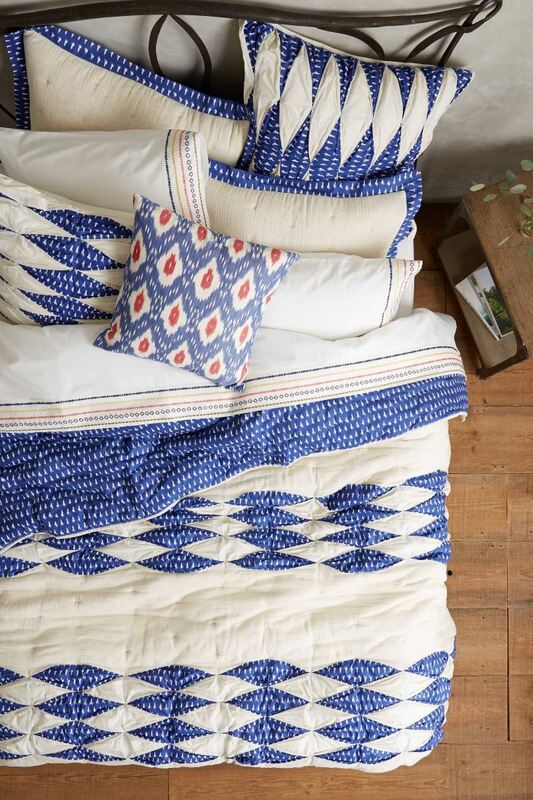 A brighter shade of indigo is showcased on the Dotted Ikat Quilt from Anthropologie, crafted from screen-printed cotton with soft crinkle gauze. 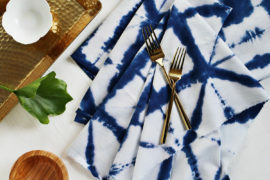 If you thought this spring’s indigo trend was limited to the classic and the earthy, the final two featured finds just might change your mind. 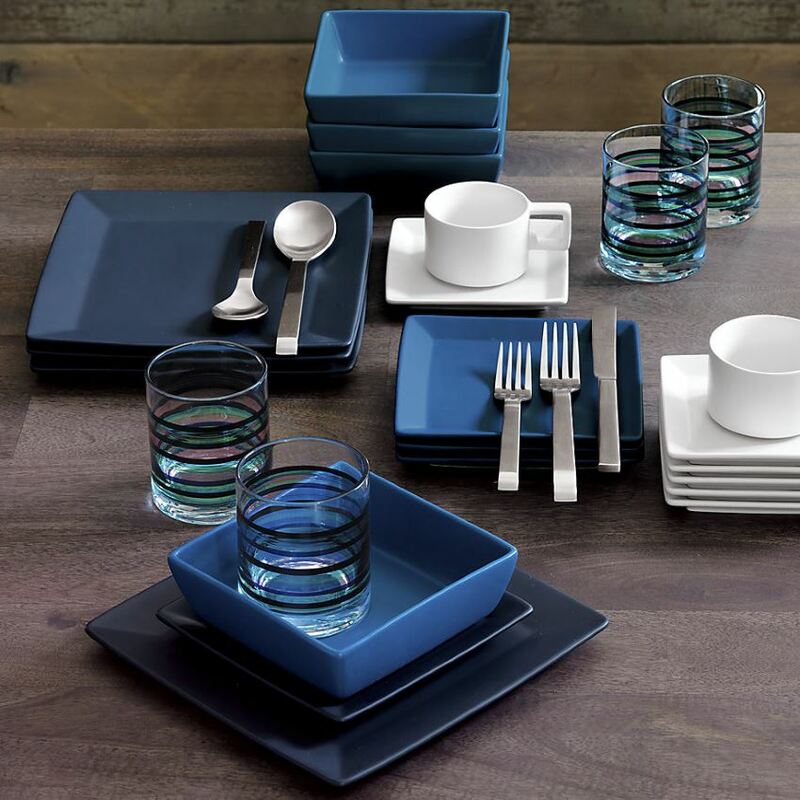 Modern style reigns in the Mood Blue Dinnerware from CB2. Featuring square forms, this dinnerware includes indigo dinner and salad plates, which beautifully combine with soup bowls in medium blue, as well as cups and saucers in white. 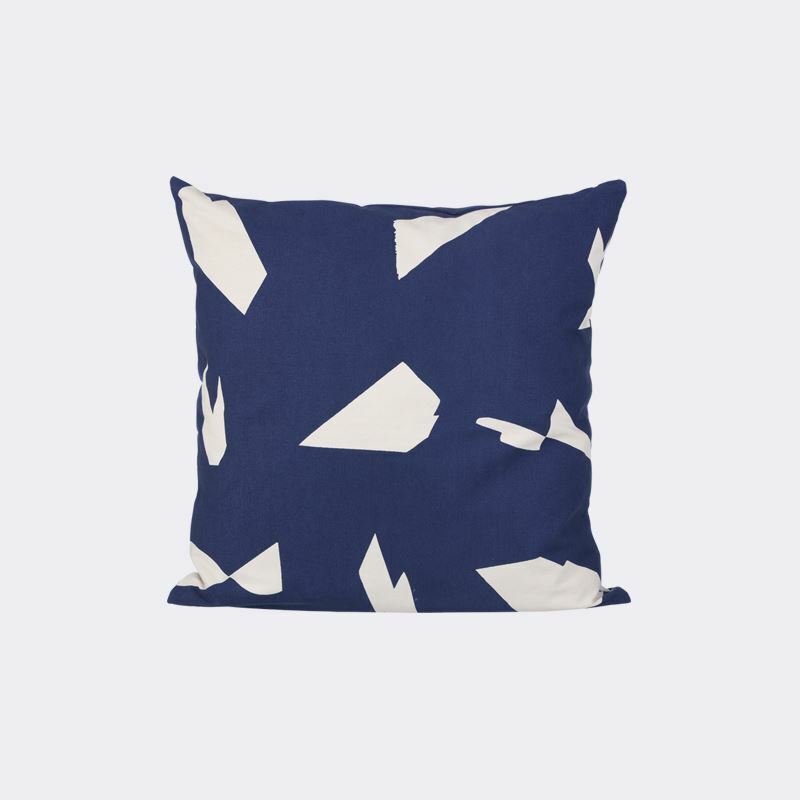 Geo style comes home to roost with the Cut Cushion from ferm LIVING, made from 100% organic cotton. Featuring a hand-printed illustration by Alyson Fox, the cushion is topped off with a brass zipper. 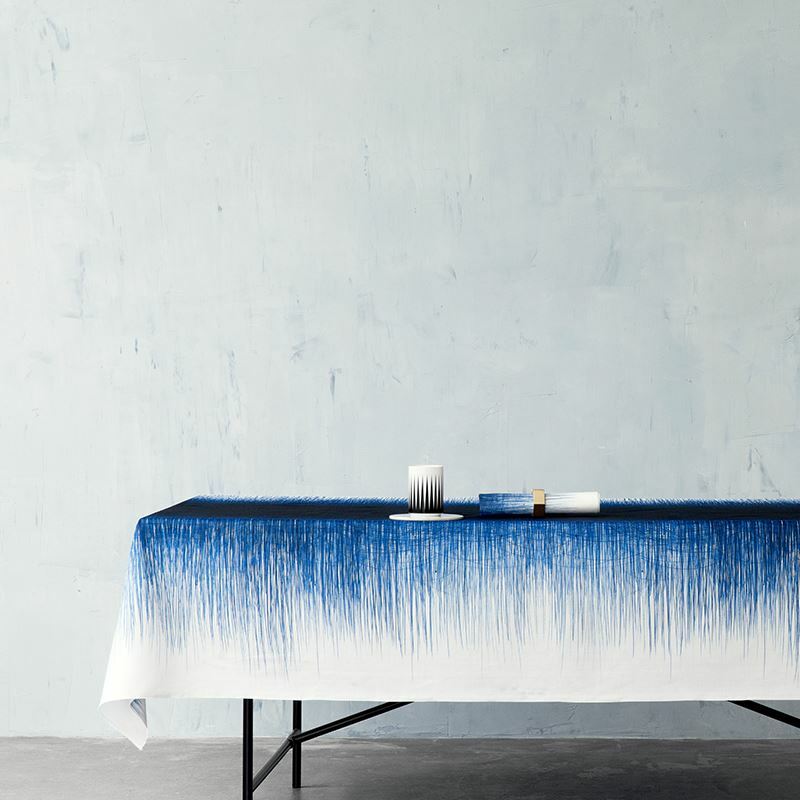 Now that you’ve seen some of spring’s freshest finds, are you ready to add a dash of indigo to your interior? !